Assessing the level of programmed death ligand 1 (PD-L1) expressed by a non–small-cell lung (NSCLC) tumor can help clinicians determine how the patient should be treated. Now, researchers report (“A Novel Approach to Detect Programmed Death Ligand 1 (PD-L1) Status and Multiple Tumor Mutations Using a Single Non–Small-Cell Lung Cancer (NSCLC) Bronchoscopy Specimen”) in the Journal of Molecular Diagnostics, a novel and rapid approach for quantifying PD-L1 expression levels in tumors that requires only small amounts of tissue that can be collected using minimally-invasive bronchoscopy techniques. This technique can also be used to discriminate malignant from benign tumors and identify mutational status, all of which can guide and refine therapeutic decisions. 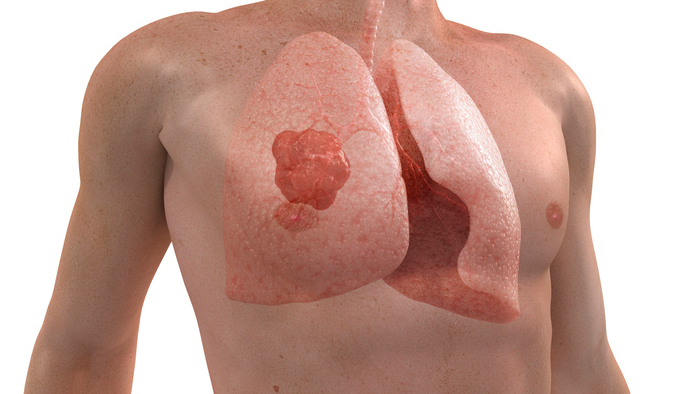 “Multiple biomarkers are under evaluation to guide the use of immune checkpoint inhibitors in non–small-cell lung cancer (NSCLC), including programmed death ligand 1 (PD-L1) tumor cell staining. We have developed a new approach that accurately quantifies PD-L1 status and identifies multiple mutations by using a single bronchoscopy specimen. A novel molecular marker was identified to detect the presence of malignant cells in radial endobronchial ultrasound bronchial brushings from NSCLC (n = 15) and benign (n = 13) nodules by quantitative real-time RT-PCR (RT-qPCR). The MMP9:TIMP3 transcript ratio was significantly increased in NSCLC and using receiver operating characteristic curve analysis accurately discriminated malignant and benign bronchoscopy specimens (area under the curve = 0.98; 95% CI, 0.93–1; P < 0.0001),” wrote the investigators. “The emergence of lung cancer screening trials will result in greater demand to define the molecular nature of suspect lung nodules. This test has the potential to save considerable time and money in identifying patients who are most likely to benefit from checkpoint inhibitors such as pembrolizumab,” explained Steven Bozinovski, PhD, associate professor, clinical sciences at the School of Health and Biomedical Sciences, RMIT University. Upon collection of a bronchoscopy specimen using brush or biopsy radial probe endobronchial ultrasound (EBUS), a small amount of tissue is placed directly in nucleic acid stabilization buffer following rapid onsite evaluation of the malignant site. RNA and DNA are isolated from the specimen and an assay is performed to quantify the expression of matrix metalloproteinase-9 (MMP-9) and its endogenous inhibitor (TIMP3). The test itself can be performed very quickly, continued Bozinovski, so diagnosis of malignancy and PD-L1 status can be determined within hours following collection. The test and scoring can be readily automated to eliminate tester variability, he adds. “In this study we demonstrate for the first time that the ratio of MMP-9:TIMP3 can accurately differentiate malignant from non-malignant tissue specimens without the need to fix tissue for histological assessment,” explained Bozinovski. In one case, the MMP9:TIMP3 ratio was elevated more than 300 times while cytology was normal. Nine months later, repeat cytology confirmed that the tumor was indeed malignant. The assay also quantifies PD-L1 transcript levels, which can have an important impact on the clinical management of NSCLC. Pembrolizumab has FDA approval for the frontline treatment of patients with advanced NSCLC whose tumors have 50% or greater PD-L1 expression as determined using the SP263 immunohistochemistry test. Patients with lower PD-L1 expression levels are more likely to benefit from a combination of pembrolizumab and chemotherapy. This study showed a strong positive association between transcript levels of PD-L1 as measured by the new assay and the FDA-approved SP263 immunohistochemistry, according to the investigators who add that enough genomic DNA from the same specimen should be available to allow multi-panel targeted next-generation sequencing to assess the total mutational burden of the tumor. Importantly, this is possible because the tissue is unfixed, maintaining the integrity of DNA and RNA. In the current report, mutations were detected in the majority of EBUS tumor specimens, including TP53 gene mutations found in 10 of 15 NSCLC samples. Such information may further refine patient selection for a particular treatment regimen. The test offers additional advantages including rapid turnaround time and automated analysis, noted Bozinovski. “We believe our test should significantly enhance the diagnostic utility of EBUS-guided bronchoscopy specimens for the molecular testing of lung cancer patients,” he said.